It should be noted that the Prosper 5000XLi has a print width of up to 24.5 inches at speeds of up to 650 feet per minute. So Webcrafters needed technology that could keep up with these press speeds with four-color printing on lightweight, coated stocks. That was one of the main reasons why pairing it with Muller Martini’s SigmaLine book manufacturing system made good business sense. Webcrafters, which was established 145 years ago, predominantly produces books in English and Spanish for schools and universities throughout the US and export markets, using its two high-performance in-line systems – the three-year old SigmaLine is likewise connected with an inkjet digital printing press, the Kodak Prosper 5000XL. “We’re probably the preeminent ‘teachers’ book’ manufacturer in the country,” says Filsinger. The books tend to average around 600 pages/title and are frequently published for multiple grades at the same time and are spiral bound, case bound, saddle stitched (for which Webcrafters in Madison uses a Primera, a SH300 and two SH 235 machines from Muller Martini) or perfect bound (using four Normbinders from Muller Martini). 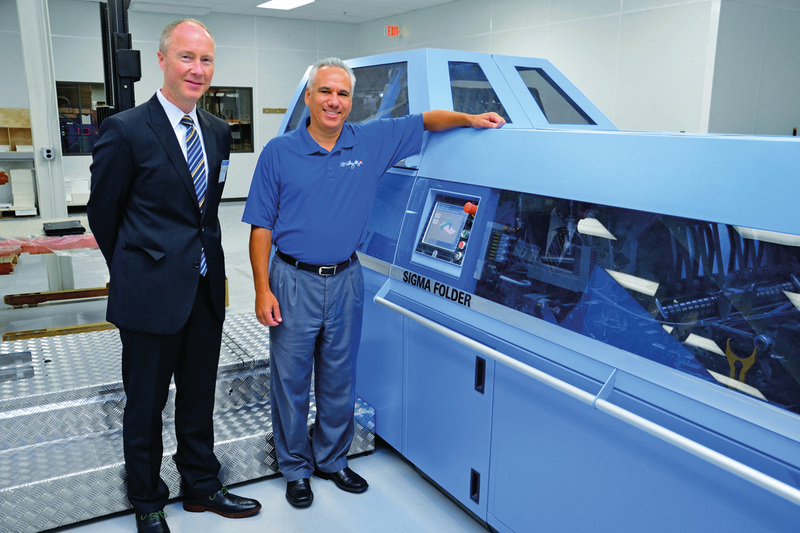 John Filsinger (right), Executive Vice President & Chief Operations Officer, speaking about Webcrafters’ digital system: “We’re very excited about the capabilities of our second Muller Martini SigmaLine, particularly since it’s able to keep up with the full operating speeds of the Kodak Prosper 5000XLi high-speed digital inkjet press». Left: Eric Olsen, Sales Manager at Muller Martini North America. Digital printing has made huge bounds in the education sector, in particular, in recent years, says Filsinger. There are three key reasons for that. First, the increasingly short time windows from when titles are released before the start of the new semester or school year, which are compensated for by the higher speeds of the digital printing presses without the make-ready aspect of conventional offset printing.